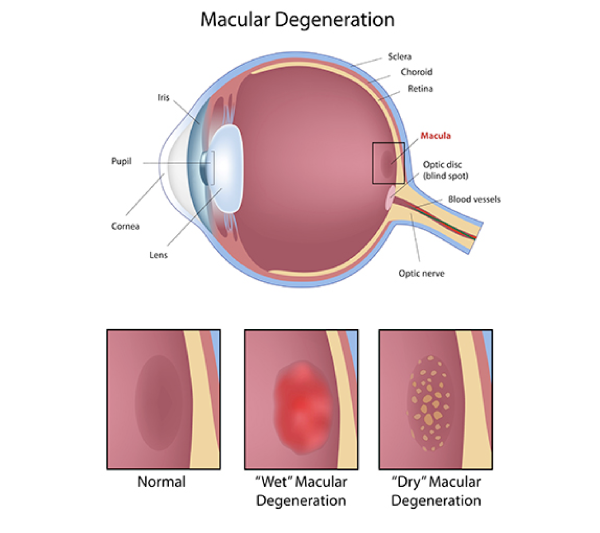 Macular degeneration, or Age-Related Macular Degeneration (ARMD) is a condition related to aging of the eye that causes loss of the central vision. It is the commonest cause of blindness in Americans over 55 years old. Approximately 10 million people in the United States are affected. Smoking, high blood pressure, family history of ARMD, and poor diet are all risk factors for the development of ARMD. The macula is the centermost part of the retina, and is responsible for the sharp vision that allows us to read and drive. In some people, as the eye ages, deposits develop in the retina (dry ARMD). This can cause the macula to function imperfectly, which leads to blurry vision. Only 10% of patients develop the wet form of ARMD. In this more devastating form, abnormal blood vessels grow in the macula, and when they leak or bleed, severe loss of the central vision often results. The symptoms of macular degeneration are blurring of the vision, which causes difficulty with reading or driving. 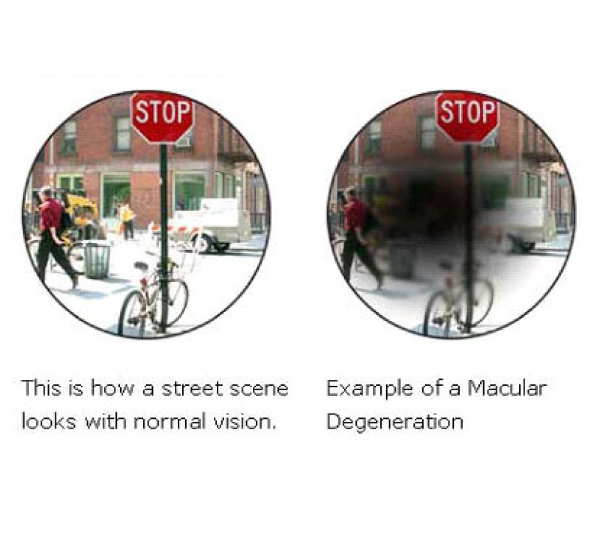 Macular degeneration does not cause total blindness because the side vision is not affected. At Kozlow Eye, a complete eye examination including dilation of the pupil will allow Dr. Kozlow to detect both mild and severe forms of macular degeneration. If ARMD is found, further testing may include a fluorescein angiogram and optical coherence tomography (OCT). Fluorescein angiography involves injecting dye into the arm and photographing it as it circulates in the retina. Abnormal blood vessel growth and leakage may be detected. OCT is a computerized picture of the macula that shows if it is swollen with fluid. Both of these tests are performed onsite. Treatments for macular degeneration are primarily targeted at keeping the retina as healthy as possible and screening for early signs of the wet form of ARMD. A study performed by the National Eye Institute demonstrated that taking special vitamins for the eye that contain anti-oxidants (A, C, E and beta-carotene with zinc) reduces the risk of developing severe vision loss. 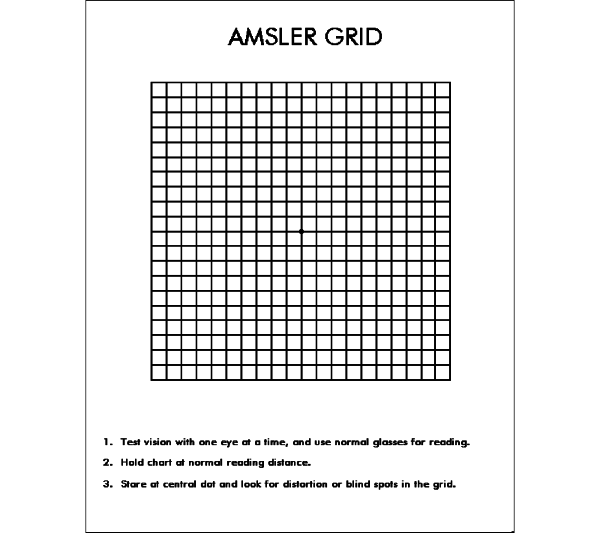 A home screening tool known as an Amsler Grid allows the patient to check the vision with one eye at a time. If the grid paper lines are wavy or faded, an eye examination is needed urgently.